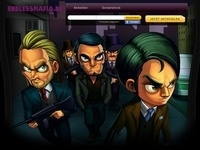 In this browser game you will walk in the footsteps of a Mafia member. By showing your strength, prestige, rank and respect you can survive in this world. Outsmart your fellow players and become the most powerful Mafiosi. Steal cars, commit organized crimes, gamble in the casino. After you have met some of these tasks, you will experience the real Crime Scene. Any violation of these conditions will result in immediate cancellation of all accounts.